Somerville first appeared in the All Blacks front row against Tonga in 2000. He has since gone on to rack up more test caps than any other All Black front row, his 62 passing Craig Dowd in 2008. Somerville has also been a crucial part of the Canterbury and Crusaders teams of recent years, winning the Super 12 and Super 14 with the Crusaders on six occasions. In 2005 Somerville was included in the Crusaders' team of the decade by the Canterbury Press. Somerville's introduction at international level came after just two seasons of first class rugby, but he was able to establish himself as a regular selection much in the same manner as he did for the Crusaders. Somerville enjoyed his first taste of a Tri Nations series in the All Blacks 46-40 defeat to South Africa in 2000. He was part of the Crusaders unbeaten run to the Super 12 title in 2002 and Somerville's first victorious Tri Nations campaign also came later that year. 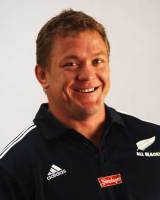 The All Blacks defended the title in 2003, and Somerville was included in the squad for the 2003 World Cup in Australia. Somerville made six appearances during the tournament as the All Blacks were knocked out by Australia at the semi final stage. He was again frustrated by Australian opposition as the Crusaders were beaten 47-38 by the ACT Brumbies in the 2004 Super 12 final. Somerville made three test appearances against the British Lions in 2005, as the All Blacks completed a series whitewash. He was then part of the victorious All Blacks sides in the 2005 and 2006 Tri Nations but would rupture an Achilles tendon against South Africa in the 2006 tournament. This injury threatened to keep Somerville out of the 2007 World Cup, but he was given extra recovery time by All Black coach Graham Henry, going on to make appearances against Romania and Portugal during the tournament. Following another successful Super 14 campaign with the Crusaders in 2008, Somerville has announced a move to the Guinness Premiership with Gloucester following the All Blacks autumn tour of the northern hemisphere. Somerville made his Gloucester debut against Calvisano in the Heineken Cup, but was almost immediately sidelined for two months with a detached retina suffered during their loss to London Irish in the Premiership. After two seasons at Gloucester, Somerville rejected a return to Canterbury Crusaders in favour of join new Australian franchise the Melbourne Rebels.